2 Properties Sleep 2-10 or 2-7 (Ref:E13492) --- Recently completed, contemporary, Self Catered Cottage 30 meters from beach. Unparalleled sea views. Every facility to make the house totally self contained, hot tub with sea views, hydrotherapy bath, steam shower, games room. Visiting masseurs, south west coastal path 100m away. Eden project 45 minutes away, wonderful local gardens to explore. Extraordinary local golf club, excellent local restaurants and pubs. Fibre Optic High Speed Wireless internet. Spotify Ipad Music System, Beaches awarded top certificates by mcs — "highest UK standard for bathing water quality". Family bathroom, bath with living Aquarium wall above bath, steam shower, wc. Bed 1 en-suite, Fabulous Egg Shaped V&B Hydrotherapy bath, large shower, wc. Bed 2 Victorian Style en-suite, slipper bath, large walk in shower, wc. TV Den basin and wc. Underground Parking for 2 Cars, more offstreet available. Underground Car Park Parking for 2 cars, more off street. 30 x 40 ft living area with open vaulted ceiling. Almost 360 degree sea views. Limed oak floors. Suspended wood burning stove, large comfy sofas, hand made oak dining table seating 10. TV Sky/sports/movies. Home cinema system, DVD, internet, phone. Large Double Door Fridge, With Ice Maker, and Walter Filter. Cooks kitchen large curved slate work top. Bosch fan assisted oven, microwave/grill/2nd oven, Aeg electric hob. Aeg gas wok. Fisher and Paygel double fridge/freezer ice maker/cool water dispenser. Siemens dishwasher, water filter, waste disposal. Spotify, Play anything you care to name. Notes on accommodation: For bookings longer than 7 days, please enquire as in high season we can only accept weekly bookings !!! We can now offer the services of a Private Chef to make your stay just that more relaxing. Also of course there is a masseurs service. Utility Room: Washing machine, tumble dryer, wc, hand basin. Cleaning / Towels / Linen / Maid service: All linen included except beach towels. All linen 400 thread count. Finest Egyptian cotton towels. Property cleaned, linen changed every Friday. (For extra cost) additional cleaning, cooking service, pack away delivered shopping before arrival. Other: Games room/TV den with fridge and tea making facilities. Large leather sofa, table football, Pool, 42" TV with Sky + hd, Sky sports/movies, DVD, iPod music system, Wii games console. PS3 + games. Utility room/loo. Leads to underground car park 2 spaces. Three generations of our family stayed at this property to celebrate a landmark birthday . We can not recommend too highly this stunning property. It offers so much with wonderful views of the ocean, yards from the beach and a fabulous design with lovely art and decor, So much attention to detail and thought has gone into the design and furnishing of this property. We had a fantastic stay with plenty of lovely places to visit , good cycle rides and very good restaurants close by. None of us can wait to visit again! WOW !!! Thank you for such a lovely review. We are really pleased you had such a nice time. Your comment in the book about watching the grand children playing board games together, which you had never seen before, was particularly touching... This is exactly the type of family atmosphere - event, that we are trying create. We thoroughly enjoyed our stay at the Buddha beach house. It was an excellent location and the house had everything to suit all memebers of the party. The house was beautiful and clean. It was also very modern and up to date. Would definitely be returning. We had an incredible stay at Buddha Beach House. The house itself was perfect - the sociable layout makes the most of the incredible views, with open space for everyone to be together, inside and out. We made good use of the hot tub, played all the games, lounged by the fire and had a great time cooking in the kitchen and on the barbecue. It was total bliss. The beds were all very comfy - even the bunks! The bathrooms were luxurious and all the extra touches were of the highest quality. We appreciated the underground parking, making it easy to unload with heaps of stuff. 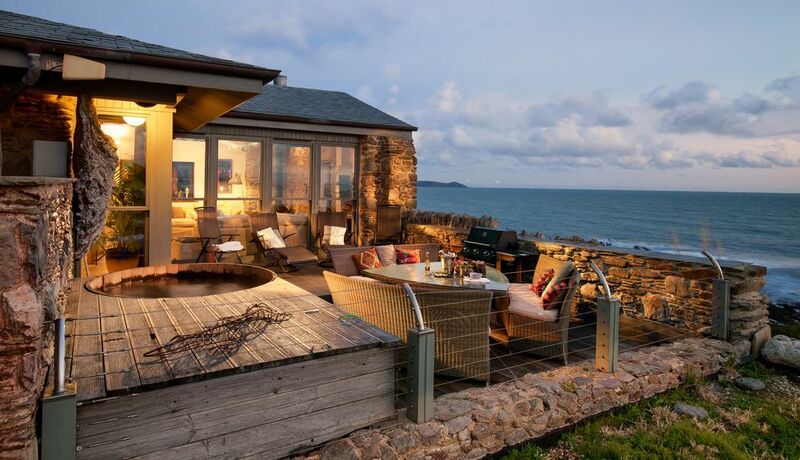 The location was astounding - right on the beach, with massive views out to sea and surrounding countryside. It was quiet, but not isolating, with quick access to the main roads. We were very very lucky with the weather, which was utterly glorious, but I'm sure we would have had an equally nice time had it been less lovely. Thank you for the lovely review. You certainly were lucky with the weather, one of the warmest periods of the year on record, I believe. Pleased you liked all the little extra touches !!! Fantastic home with so many benefits ! We love this place, our second visit in a year and going back in September. The view is amazing and the artwork and ambiance is brilliant, it really feels like home for us. We would not hesitate to recommend it to anyone. Rod and Suzy are so lovely and helpful too..what more could you ask. Thank you for such a lovely review. Lets hope the weather holds out for your next visit in September. The house is in a bay where there is a micro climate, it can often be pouring with rain in Somerset where we are based and wonderful sunshine in Cornwall, even in December !!! Spectacular location, beautifully furnished, well equipped. Thoroughly enjoyed our stay. The house is everything you would expect and more. Only downside for us was the local cafe The Jolly Roger was expensive and disappointing and the pub up the road was closed due to a fire so we had to drive out a lot. Didn’t spoil our holiday though. This is a fabulous house in a quiet unspoilt part of Cornwall. We were a 3 generation family from the ages of 5 to 65 and everyone absolutely loved it here. From the hot tub on the terrace with superb sea views to the calmness and comfort of this lovely home. The name 'Buddha Beach House' really suits the property and we found it to match the description given 100%. There are some beautiful and quirky pieces of art all over the house for all to enjoy which we found exceptional as lots of holiday homes are usually very minimalistic. The beach was literally a few steps away and our grandchildren loved searching the rock pools for wildlife. There was so much excitement when they found a large starfish. This house has a definite home from home feel and we would have no hesitation in recommending it to anyone. The owners were really swift with their responses throughout. There were tears from our granddaughter on leaving so I'm pretty sure we'll be going back again to enjoy this peaceful, tranquil house and location. Thank You so much for your lovely review. We hope to see you next year. 30 meters to right of house nearest sandy beach. Lots of rocks at low tide, so wonderful for children to explore. Another beach 100 meters to left of house. Surfing beach 5 minutes by car. Lots of lovely coves to explore at low tide or by small rib which is available to hire. Technology. The house is full of workable technology. We have recently installed a dedicated 12 meg download 4 Meg upload Satellite Internet connection. So you can actually use Skype. This is in addition to the standard BT Internet connection. We have also installed an Ipad3 connected to the Internet, with Spotify Music system connected to the home cinema system, which gives you access to virtually every album produced. Wonderful for listening to all those nostalgic songs from your youth, or latest pop charts. We have a Sky connection along with Sky Sports, and Sky Movies. Sony PS3 player with Blue Ray player, Wii games system, 3 Ipod Music systems etc etc. Booking Notes: Please ask for payment terms. If occupation date is longer than 6 months then there is the option to pay in 3 installments. Changeover day is Friday. Arrival after 3pm. Guests asked to leave by 10am. Possibly more flexible on leaving times for short breaks. Notes on prices: Prices shown are price ranges ie From £1,295 in low season to £4,295 in high season. Prices will vary. Please enquire as to exact price and availability. We have know be be flexible on pricing so please enquire, or we may have another house to suit!